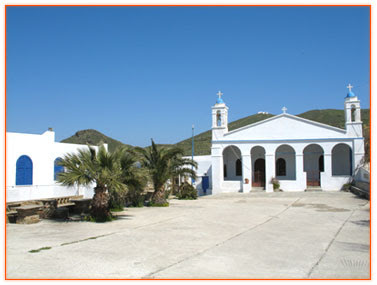 One of the most significant Orthodox pilgrimage sites on the island of Tinos is Panagia Vourniotissa (named after the mountain village), situated near Agapi village. It is officially celebrated on September 8th (Nativity of the Theotokos) and on the 24th of the same month (Panagia Myrtidiotissa). There once was a chapel dedicated to Saint John the Forerunner on the location where today lies the church, on the mountain slope. Today, the walls of that small church form the southern side of the women's gallery. According to tradition, in those years there was a mural of the Platytera (the Widest Embrace) which was removed and the icon of Saint John took its place. The discovery of the wonderworking icon was made on the 8th of September in 1670. According to tradition, the night before, the villagers of Sklavochorio had gone down the steep northern coast to fish. At the crack of dawn they saw a strange light emerging out of the sea waves and approaching the shore. One of them fell in the water and approached the light. To his surprise he realized that it was the icon of Panagia Vrefokratousa (the Virgin Mary holding baby Jesus), which had been probably swallowed by the sea following some shipwreck. The fishermen venerated the holy icon and made their way back home. When they reached Saint John's Chapel, they placed it on the Holy Altar and went outside for a while. When they tried to pick it up again, they realized it was impossible, as the icon seemed to be too heavy for them to lift. They returned running to the village and informed the priest and their fellow villagers what had happened. The Orthodox villagers of Sklavochorio and the Catholic ones from Agapi village then formed a holy procession and headed over to the chapel. 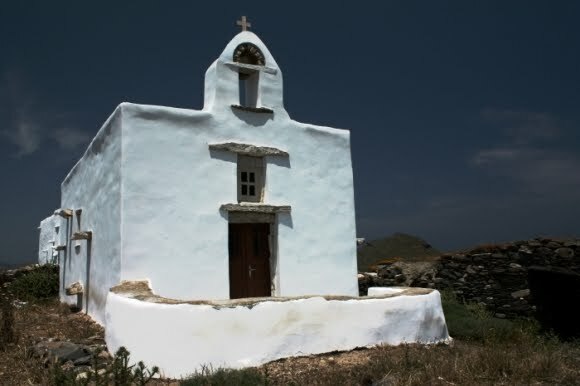 Following a Paraklesis Service the first foundation stone for the church of the Panagia was placed. Construction lasted till the 24th of September of the following year. The church was given its present layout thanks to the donations and the labor of the inhabitants of both villages. A 1778 document informs us that Methodia, a nun from Kechrovounio Monastery, bought two fields near the church. When she passed away, the church and the villages came under the jurisdiction of the Monastery. Ever since 1925 the preservation of the complex and the organizing of the feasts are undertaken by the "Vourniotissa Society". The wonderworking icon of the Panagia is located today at Kechrovounio Monastery. 1. An iconographer from Arnados went to the church one morning to work. Three days passed and he had not returned home, making his family think he had gone missing. His wife and children, now very worried, went to the church to see if he was there, and they found him. He was there working and had not touched the food he brought with him those three days. When they asked him why he did not eat his food, he replied that it was not even noon time and that he was too busy working to stop and eat before lunch! He was amazed when he found out that three days had passed without him realizing it. 2. A woman was cleaning the church, and as it was getting late she worried that she would have to spend the night there. A villager came that night in order to molest the woman. Surprised he saw lights in the church and it was full of people chanting. He entered the church, followed the vigil, then returned to his farmhouse. In the morning he was surprised to find, when after asking the woman and the other villagers, that there never was a vigil in the church the night before. The villager thus donated to the church his land which was adjacent to the church. 3. A villager whose wife was seriously ill went to the fields surrounding the church to plow it. Facing the church, with tears in his eyes, he supplicated to the Panagia to help his wife. A nun suddenly appeared before him, and told him from that moment his wife was well. The nun then disappeared as suddenly as she appeared. The villager, full of expectation, returned home immediately and found his wife well.